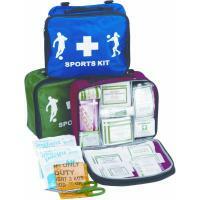 First Aid Basic Sports Kit. Sports bag available in three different colours; Green, Blue and Red. Well organised medical safety kit put together for fun day sporting activities.